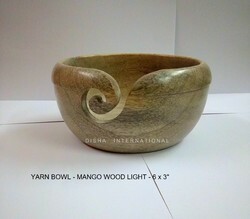 we are manufacturer and exporter of wooden yarn bowls. We make these yarn bowls in all possible sizes and in different wood as required by our buyers. They are made in Sheesham wood, Pine wood, Mango wood, Maple wood and some other local varities of wood. These bowls are made to perfection by our expert artisans with smooth polish and finish. This yarn bowl is made of very fine variety of pine wood with stunning finish and smoothnes. Any other design and size can be made in pine wood as per buyer's specifications and requirements. We can make these bowls in 5x2.75", 5x3", 6x3". 7x3", 7x4" or any other size. 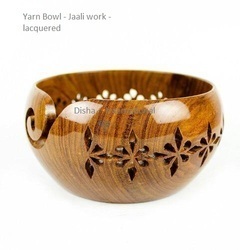 This yarn bowl is made from the finest variety of sheesham wood with international quality standards. Polish and finish of this bowl is absolutely smooth and silky so that the yarn does not entangle while working. It can be made in any size as required by the buyer in sizes of 5x2.75, 5 x 3, 6 x 3, 7x3, 7x4 or any other size. Available in other variety of woods like pine, mango and cam wood. we are manufacturer and exporter of wooden yarn bowls from INDIA. 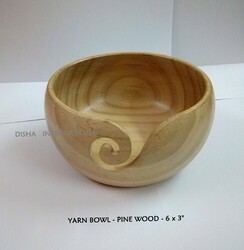 We make all possible sizes of yarn bowls in mango wood, sheesham, pine or any other variety of the wood. These bowls have a perfect finished swirl and hole for the wool thread to move out to make sure the thread doesn't get entangled or get into skien knot. This wooden yarn bowl is made of a strong wood and lacquered for a shining get up. This intricate jaali work is done very artistically and carefully to give a neat and clean pattern for art lovers. Many different patterns can be given on jaali work. 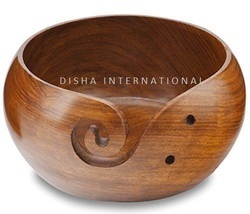 This wooden yarn bowl is made from Indian Rosewood(Sheesham) with piercing pattern. Beautifully crafted is this bowl and is hard to resist for not buying. A nice gift for grannys and nannys. We are manufacturer and exporter of wooden handicrafts from INDIA for the last more than 2 decades. We make wooden yarn bowls to the perfection by our expert artisans. FInish and smoothness of the bowls is absolutely stunning. These yarn bowls are made in different woods like Mango, Rose wood, Mapple wood, Surina, Sheesham wood and many other varieties of wood. These are made in different sizes as per buyer's specifications and requirements. It’s a bowl in which to put yarn ball while you’re knitting and solves the problem of the ball of yarn rolling and bouncing around the room during knitting. Happens to me all the time and boy is it annoying. Yarn bowls have a cutout which is used as a guide for your working yarn. The working yarn is placed through the cutout, and when the yarn is pulled, thanks to the weight of the bowl, the ball will roll in the bowl freely without getting tangled or rolling away.